Sundown is near, and it's almost time for the Seder to begin-- but where is Pippa's special Passover plate? Pippa the Mouse has been working hard all day-- cleaning her house, setting the table, cooking the meal. Everything looks great-- but her special Seder plate is missing! 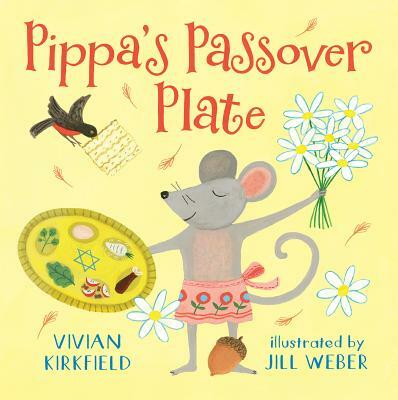 A charming story with a happy ending, Pippa's Passover Plate pairs simple, rhyming text with bright paintings by Jill Weber, illustrator of The Story of Passover and The Story of Esther. In bravely facing her animal neighbors, this adorable little mouse finds not only her missing Seder plate-- but new friends. Filled with rhymes and repetition, this is a perfect title to share and read aloud, just in time for your own Passover festivities. A final spread with Pippa and her guests getting ready to hide the matzo and celebrate also shows the Passover plate with its six essential symbolic items: zeroah (a roasted bone), beitzah,(an egg), maror and charoset (bitter herbs), chazeret (mortar or paste), and karpas (a spring vegetable). Vivian Kirkfield is a children's picture book author and a former early childhood educator. A passionate advocate for children and reading, she is the creator of the popular and award-winning blog "Picture Books Help Kids Soar" and the author of Show Me How! Build Your Child's Self-Esteem Through Reading, Crafting and Cooking. She lives in New Hampshire. Jill Weber also illustrated Even Higher! and The Story of Esther, both by Eric A. Kimmel, as well as The Story of Hanukkah by David A. Adler. She lives in New Hampshire.